H: April 16, 2012: My opening day for trout was this past Saturday on the Delaware river. 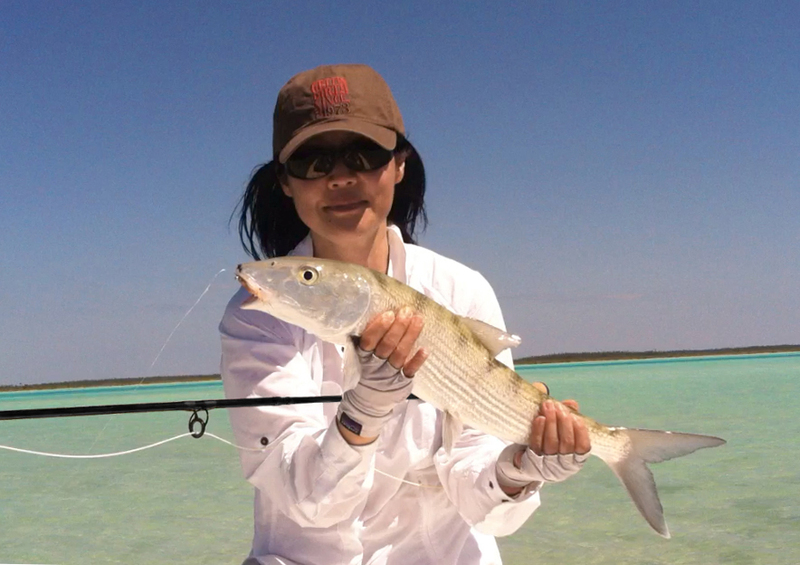 After my bonefish trip, I was relishing the thought of fishing in the company of women, but it wasn't meant to be. In fact, it looked like it was going to be a solo trip. Josée was going to Boston. Marcy would most likely be in Mexico for work. I even asked Shannon and Margaret, two fellow Juliana's Anglers, but no one was available. 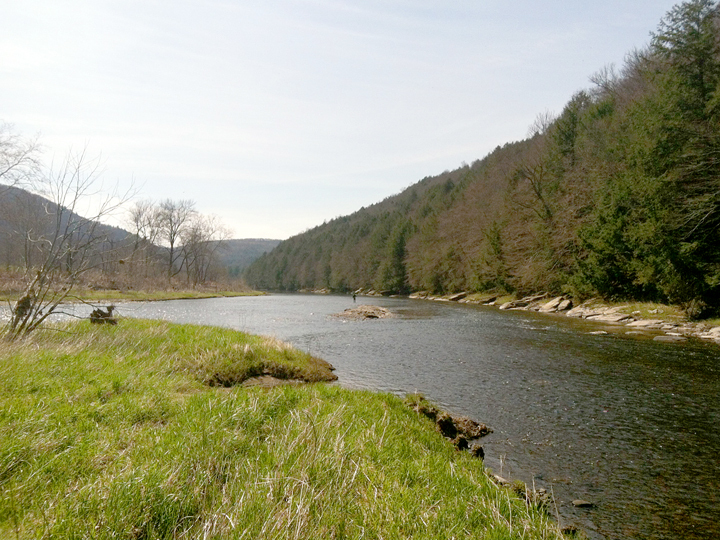 I recently started reading Paul Weamer's Fly-Fishing Guide to the Upper Delaware River. With water levels so low, I thought this would be an excellent opportunity to wade and explore areas that normally are not easily accessible. I've heard so little spoken about the Main Stem from other anglers. I was curious to find out why this is so. 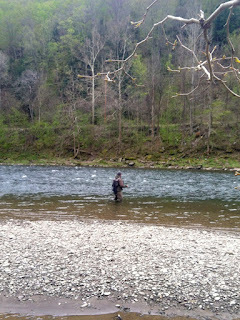 My plan was to make a quick morning stop at the West Branch Angler to check out their "Hell or High (Low ; ) Water" event, pick up some flies and river intel, then head over to the upper Main Stem to fish. 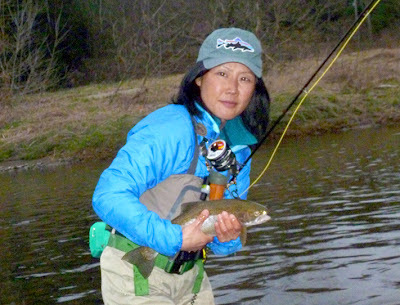 Exploration of uncharted waters, quiet time on the river, get re-acquainted with Mr. and Mrs. Hendrickson, and hopefully catch some beautiful wild browns and rainbows... What more could a flygirl ask for? Well, as luck would have it, Craig was going to be fishing the Delaware on Saturday. I asked if he wanted to fish with me. I fully expected another refusal, but instead, he asked that I meet him in Hancock at 10 am. He was going to visit his friend Richard on the lower East Branch. He invited me to join them. I happily accepted. The lower East Branch of the Delaware, just downriver from Richard's cabin. Well, at least until I started to cast into some fishy looking seams and eddies. Having cast an 8- and 9-weight for over 3 months, the 5-weight felt like a feather in my hands. You would think this would be a good thing but it felt as foreign as the 8-weight had just a few months ago. It didn't help that I was ill prepared for my trip. All I had with me was a hastily assembled fly box containing a few flies I picked up at Urban Angler—a couple of hendrickson duns, quill gordons, blue quills, and rusty spinners—along with flies from the tail end of last season. Even my lanyard was not properly set up (I had removed my nippers and forceps to take with me to Andros). I was quite disorganized, which is unlike me. I looked downriver and noticed that Craig had a fish on. He was walking towards the bank. I figured he was planning on taking some pics for his blog. He waved for me to come over. He had a handsome large male brown in his net. We took a few pictures before Craig released him. There were several rises by the far bank, so we went over to fish. Craig started coaching me. I know he was only trying to be helpful, plus he can't help himself, he's a fly fishing instructor. But I wanted to do this on my own. After all, the trout river was my element. It would come back to me. Well, I missed a few hits after changing flies about 5 times. I scowled at my fly box—I didn't like anything in there. My casting was rusty. I couldn't see my damn fly... I was happy to break for lunch. Richard was a gracious host. I enjoyed some delicious food and wine in his charming cabin by the river. He even gave me one of his hand-tied comparaduns which I successfully fished with later that afternoon. Despite my earlier frustrations, I finally caught my first trout of the 2012 season, a lovely East Branch rainbow. I gave her a quick gentle hug before releasing her. She made my day. In fact, I had a great day fishing with Craig and Richard. 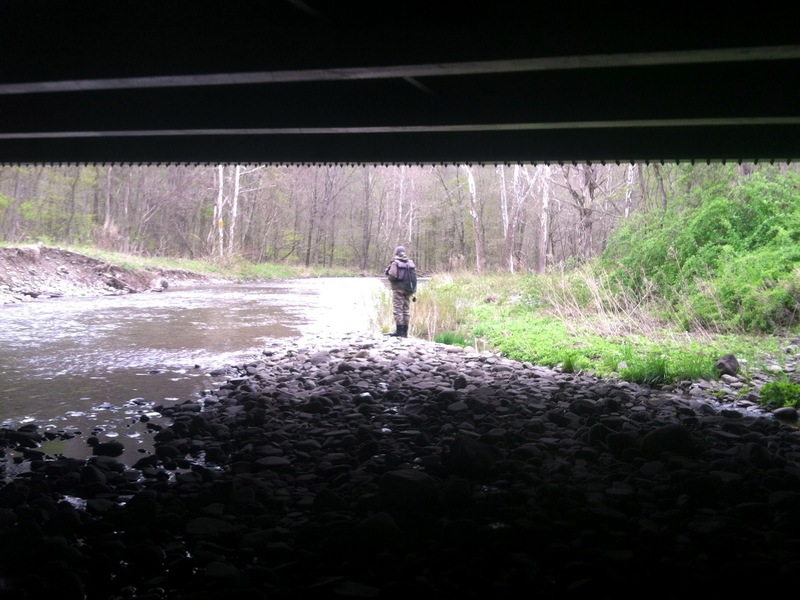 Craig would laugh exuberantly like a school boy (or a mad fly fisherman ; ), every time he had a fish on—his infectious laughter cut through the silence of the river and would make me smile. And the easy camaraderie between Richard and Craig reminded me of fishing with Josée. Opening day trout—a lovely East Branch rainbow. Photo courtesy of R. Ross. Saturday, March 24, 2012: Woke up sore and achy with a dull throbbing headache from my accident 2 days before. At LaGuardia airport, I meet 6 of the 7 guys on our trip: Dave, Rich, Bob, Mark (plus Andrew and Tim). We're on the same flight to Nassau. Turns out all of them have 15+ years fly fishing experience under their belts and all except Mark have bonefished several times before. First impression: a very diverse and seemingly nice group of men. We arrived in Nassau earlier than scheduled and met up with the final member of our party, another Andrew, who I will refer to as British Andrew. With 4 hours to kill before our connecting flight to Andros, we head over to a local jerk shack to have a few drinks, eat lunch, and get to know one another. We were certainly a motley crew ranging in age from mid 30s to the mid 60s. This is just an educated guess since Rich is retired and Tim won't tell anyone his age (he acts 15 but is probably in his 50s? ; ). Besides Mark, who lives in Westchester, the rest are Jersey boys. Day 1, March 25, 2012: As we're heading out to the flats, Andrew tells me the wind is all wrong today (from the wrong direction). As a result, the fish were unsettled. The few bones we saw in the morning were incredibly spooky. But things started to change in the afternoon. They started to feed more aggressively. Boy, was I in for a rude awakening! 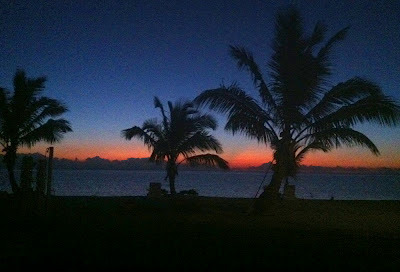 I had arrived on Andros with some confidence in my ability to cast in the wind (see Taming the Wind...). But it's one thing to practice in a park at leisure and another to have to cast quickly and adapt to rapidly changing circumstances on the water when you're excited as a schoolgirl at the prospect of catching your first silver ghost! 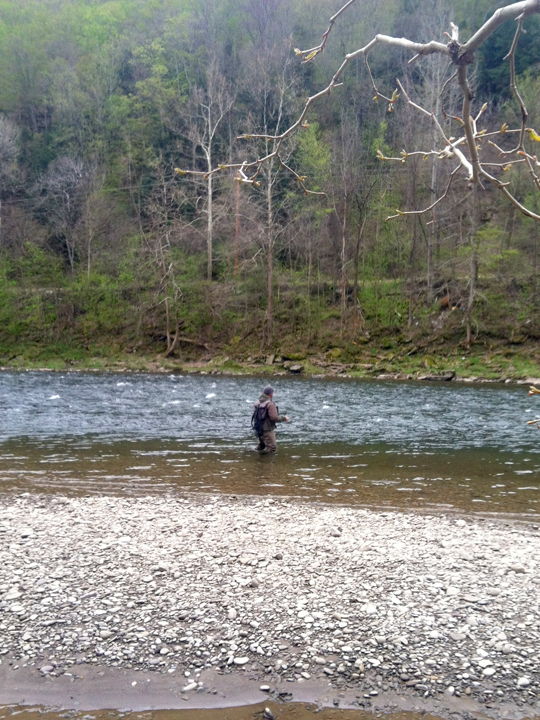 I lost 1 fish earlier that day to the dreaded trout set. I was getting more and more discouraged but Andrew was so supportive and encouraging, I just couldn't let him down. I stuck with it, however spastic and awkward I felt at times. Sure enough, towards the end of the afternoon, I hook, fight, and land my first bonefish, a beautiful 4-pounder who took most of my line. It was absolutely exhilarating! 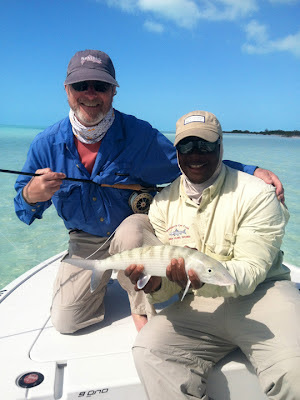 I had read and heard about the speed and power of these creatures but nothing can prepare you for the actual experience itself—the sheer adrenalin rush—the "bonefish high". I'm beginning to understand why bonefishing is an obsession with so many fly anglers. Besides catching my first bone, the other highlight was watching Andrew hook a huge (4-5 feet long?) barracuda. I've never seen a barracuda attack a fly before. It's an incredible sight: lightening fast speed (it wanted to ravage that fly! ), powerful jumps, amazing agility. Upon returning to the dock, we find out it had been a very slow day for most of our group with the exception of Tim and British Andrew. I felt very fortunate to have caught my first bone that day. I have Andrew to thank for it. Day 2, March 26, 2012: I was surprised to learn that I'd be fishing with Andrew once more. Lord knows, I don't mind. I would happily fish with him every day. But I had hoped to fish with him later in the week when I finally got my bearings. Tim, on the drive to the dock, hands out the special shrimp flies he ties. They are very detailed and realistic: "Trimp," as British Andrew called them, aka Tim's shrimp (he does a mean impersonation of them, too : ). Our guide today was Percy. 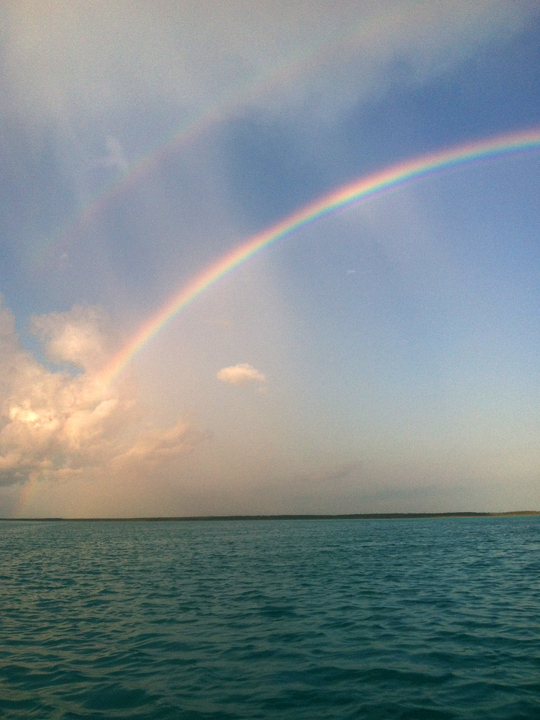 As we're heading out, it starts to drizzle, but a full arching rainbow provides stunning consolation. 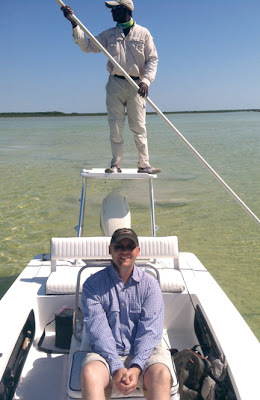 This time around, Andrew hung back and let me work with the guide. I still had great difficulty spotting the bones unless they were about 20 feet away. It's incredibly tough when you can't see what you're casting at. You're a blind person at the mercy of your guide and must trust and rely on him implicitly. I clocked and spooked quite a few bones but usually I took too long to cast and ended up putting my fly behind them. It's day two but I'm still a complete spaz. The casting tips Andrew gave me the evening before are thrown out the window during the heat of the hunt and my overthinking incapacitated me. I broke off 1 fish due to an overzealous strip set and hold. 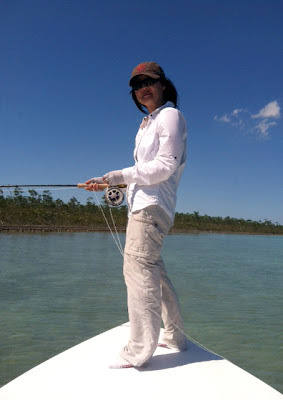 Somehow I managed to catch 2 bonefish that day. One I lost just by the boat—almost landed—I'll count it! The other was a gorgeous 5-pounder, my nicest fish of the trip. Watching Andrew cast and fly fish is a thing of beauty—like listening to a virtuoso musician or watching a prima ballerina's solo—effortless technique, finesse, lethal focus, and pure joy (even when he's managed to wrap the line around his legs, he does a graceful "bonefish jig" ; ). But it's also quite intimidating. You can't help but feel a bit inadequate—in my case, quite inept. By day's end, I had pretty much lost all confidence in my cast. (Clearly, the blow I suffered to my head had landed in the area that controlled motor coordination ; ). But I knew this would change. I knew I'd catch more fish. Today, just wasn't my day. Besides, it doesn't take much to make me happy—1 perfect fish did the job that day. 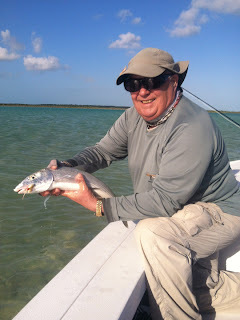 Andrew hooks and almost lands another smaller barracuda. It was supposed to be Percy's dinner that night but it caught a lucky break right alongside the boat. Day 3, March 27, 2012: Today, I fished with Tim. I had met him a couple of times before at Tight Lines. I have to admit, I had some reservations about him. But as the days passed, I got to know him. He turned out to be a very nice guy and quite the character! We fished with Alvin that day. The free flowing banter on the boat was lighthearted and I started feeling at ease. My casting wasn't perfect but I stopped sweating it. I encountered my first tailing bone that day. Tim estimated it was about 8 pounds. What a glorious sight! We were on an unusual flat whose bottom was composed of large sand and coral moguls, beside a very deep channel. I had a few shots at him and at one point he started following my fly. But somehow during the chase, he momentarily lost sight of it, zoned in on another tasty meal, dove down for it, and tailed once again right in front of the boat. Oh well, that's fishing for you. To repeat what was said numerous times throughout the week. That's why they call it fishing, not catching... I had a personal best that day: 6 fish. I had lost track but that's what Tim told me. I caught quite a few and I had fun. Day 4, March 28, 2012: Winds were blowing 25-30 mph. It was going to be a tough day. I was fortunate to have Alvin as my guide, again. I enjoyed his company the day before and thought he was an excellent guide. Plus, he was familiar with my strengths and weaknesses. Today, I'm fishing with Rich. The thing with fishing with Rich is that he's pretty hard of hearing. You have to play the part of middle(wo)man, relaying each and every command the guide gives out. Otherwise, Rich can't hear them. Granted, there is a 2 second delay, but it's better than nothing. I didn't mind playing this role. I had sympathy for Rich. His hearing disability made him a bit of an outsider in our group. He rarely engaged in conversations during dinner because he can't hear most of it. Rich with one of his bones. Despite very challenging conditions, we both land several (4-6?) bones each. We have Alvin to thank for our success. All day long, he put us in situations where we had a strong chance of catching fish. When we return to the dock, we find that we had a singularly good day compared to the rest of the group. You saw it on their faces as they got off the skiffs. No smiles or light banter. The mood is quite sullen. The usual daily fishing post-mortem begins: "So, how'd you do?" "Awful. We caught 1 fish all day…" Quiet. Someone asks us how we did. "Not bad," I respond. As it turned out, it was still a very exciting day: 2 anglers fell from their boats (no one was hurt) and 1 very large tiger shark had hung out with Andrew and Tim. I would have loved to have seen that. The pairing of the next day's fishing partners was something Andrew and Tim magically worked out the night before. I can imagine it's a thorny process, like arranging the seating charts for a contentious wedding. This night, however, Tim brought it to the dinner table. "So, who wants to fish with who" he asked? I thought this was a terrible idea. As a beginner, I figured I was at the bottom of the bonefishing totem pole along with hard-of-hearing Rich. Was this going to turn into an ego bruising playground team picking event? Would Rich and I draw the short straws and end up fishing with the least favored guide? Talk of catching Bonezilla, Moby Bone, Brutus Bone, Tyrannosaurus Bone… while quite humorous to me in the past, seemed juvenile that night. Where's my flygirl, Josée, when you need her? The testosterone levels in the room were rising fast and when they reached a suffocating level, I just got up and left. I went to my room, listened to music, made a barracuda leader (that seemed to calm me... it's like knitting ; ), and went to sleep. I decided, regardless of who I fished with, I would make the most of it, try my damnedest to catch some lovely bones, and have a great day. Day 5, March 29, 2012: The brutal wind finally diminished. I woke to a glorious sunrise. At breakfast I find out that I'll be fishing with British Andrew. Randy would be our guide. It really didn't matter to me. Just like the weatherman forecasted, it turned out to be a picture perfect day on the flats: relatively clear skies and minimal wind coming from the ESE. It was the first day that I felt calm, cool, and collected. I started seeing the fish better and made controlled accurate casts. Both British Andrew and I caught numerous bones each (mostly 3-pounders, perhaps a couple close to 4). I had a great time. The sun was shining, the flats of the Middle Bight where we fished were a breathtakingly endless sea of turquoise, and both British Andrew and Randy were terrific company. Aprés bonefishing that evening was a festive event, in sharp constrast to the previous night. People were smiling and happily swapping stories of the day's successes. Well, all except Tim, who apparently lost Moby Bone towards the end of the day. But several Kaliks later he was back in spirits. That night revealed several people's true colors, or so I thought. One person insisted on knowing exactly how many fish I had caught. I had said that I had a great day, but that wasn't good enough. Was he afraid of being outfished by a flygirl? Jeez, it's not the number of fish you catch that matters! Shots of vanilla scented rum flowed freely, and when the conversation veered towards fishing partners for our final day of fishing, I put in my 2 cents. I said I wanted to fish my last day with Rich. And I suggested the triple "A" threat of Andrew, Andrew, and Alvin since none of them had fished with each other yet. I said goodnight and went to bed. The Burnt Rock Snappers wished us luck at the dock. 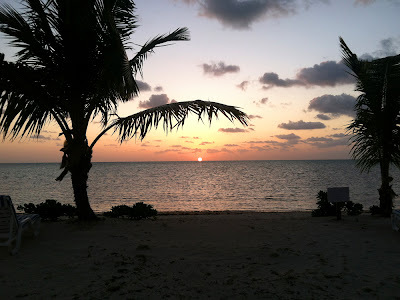 Day 5, March 29, 2012: At breakfast I find out that Rich and I will be fishing with Marvin who is considered one of the best guides. He's incredibly personable. I liked him instantly. We mentioned we’d like a shot at some of the big fish on the east side that Dave and Tim had encountered the previous day. He knew we weren’t very experienced but took us there anyways. Rich was up first. The light was still low and it was hard to see, but Marvin managed to spot a small group of “bluebacks.” Rich had a few shots at them but they were generally 60+ feet away into the wind or needing a backcast into the wind. It wasn’t going to happen. Rich had taken a brief lesson with Andrew the night before and was trying to modify his cast. As a result, Rich was a mess that day. I don't believe it's possible to alter something as fundamental as your casting stroke, especially one that has been developed and ingrained over 20 years, under the duress of challenging fishing. He caught his fly and line around Marvin’s pole—fortunately, he missed Marvin. He even cast for about 30 seconds before he finally heard us yelling that he had not yet unhooked his fly from the rod guide. I felt for him—he was just having one of those days. I knew all about that. Despite the chaos, I tried to be supportive and remain calm. I got up to have a go but unfortunately we only saw one pair of bluebacks about 70 feet out, moving away fast. I didn't even attempt a cast. Marvelous Marvin on the Middle Bight. Marvin wisely decided to take us back to the Middle Bight for some easier fishing. He said he’d try to get us on big fish later in the afternoon after we warmed up with smaller prey. We made the 20 minute trip out and encountered a couple of schools of smaller bones in the 3-pound range. Rich settled down and we both caught several each. After lunch we headed back east to a spot that Marvin guaranteed would hold lots of fish. He said he had them anchored out there. I laughed at his “joke.” Turns out he wasn’t joking. We head out to a point not far from our takeout spot and within minutes we spot a large school of bones ranging 4-5 pounds. 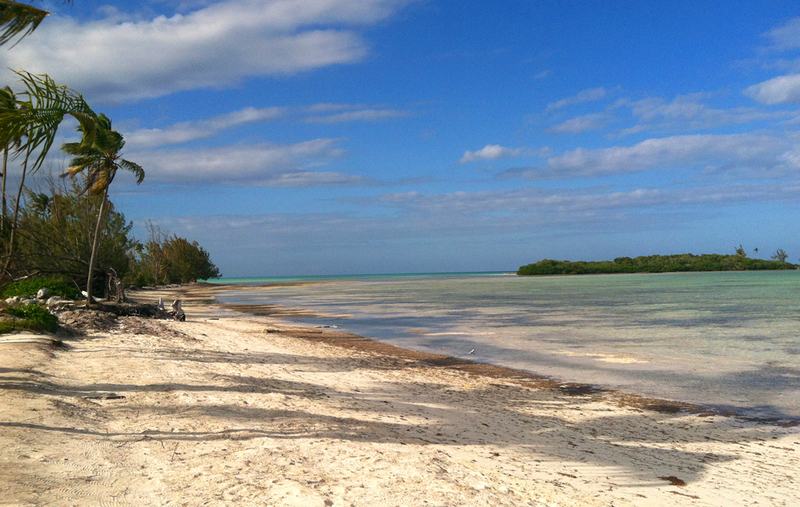 The point was swarming with lemon sharks. This was apparently their favorite lunch spot—the corner deli. Despite the bottom being a mottled gray/green, the fish were reasonably easy to spot. We had about an hour of fishing left. 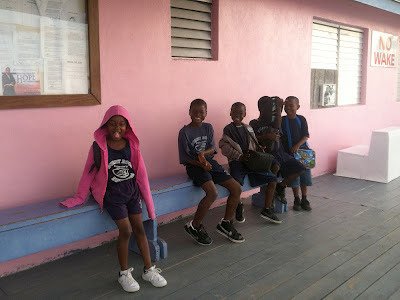 Marvin put me onto the school. But once he knew I could see them, he let me fish with minimal direction. I would cast, let my fly sink, strip slowly to see if there was any interest. If not, I would recast and do it all over again. I managed to catch 2 lovely bones despite heavy pursuit by sharks, including my finale fish. It was incredibly satisfying! That's when I realized, after 6 days of fumbling and fishing, I had somehow managed to become a bonefisherwoman. Just as I started feeling comfortable and gaining confidence, it was time to go home. I’m already thinking of where to go next. I’d gladly return to Andros and Swain's. Perhaps a few days at Swain's and a few down south so I can see more of the island? Plus, I definitely need to check out those blue holes... On the trip back to NY, three of us had a long layover in Nassau. Bob and I start brainstorming ideas for a future trip. Los Roques? Cuba? Another Bahamas out island? Bob throws in Christmas island. I counter with the Seychelles. The possibilities are endless and exciting. As I head back home to 40 degree weather, I’m wondering how my local rivers are faring and what the hatches are doing. I’m curious as to how I’ll feel back out on a trout river. Will I enjoy it the same? I guess I’ll find out soon enough. Andrew Moy and rest of my fishing partners: Tim, Rich, and British Andrew for making this a trip I won't soon forget. 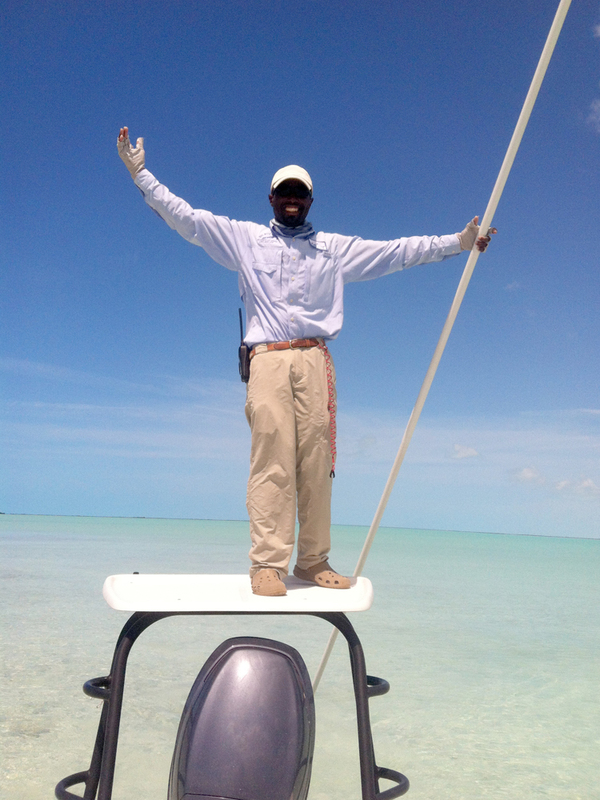 Alvin, Marvin, Patterson, Percy, and Randy—all terrific bonefish guides. Our gracious hostess Cheryl, her staff at Swain's Lodge (especially Darcelle for her delicious conch salad), and all the wonderful Bahamian people I had the great fortune to meet on Andros.